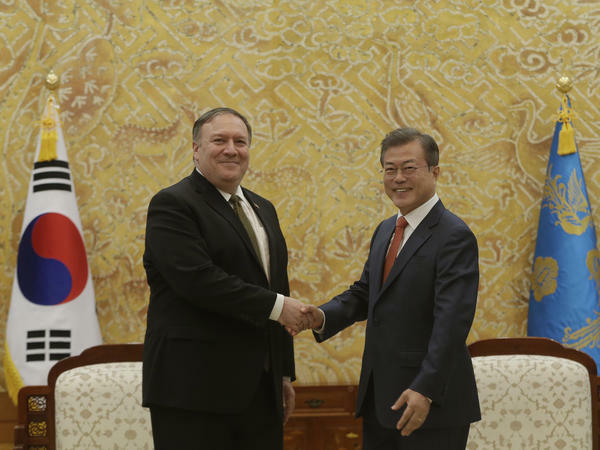 U.S. Secretary of State Mike Pompeo (left) met with South Korean President Moon Jae-in (right) on Sunday at the presidential Blue House in Seoul, following talks with North Korean leader Kim Jong Un in Pyongyang. "Had a good trip to #Pyongyang to meet with Chairman Kim," Pompeo said on Twitter, adding that the leaders "continue to make progress on agreements made at Singapore Summit." A U.S. official who accompanied Pompeo on the trip, and spoke to Fox News on the condition of anonymity, said the Sunday meeting was "better than the last time" but that "it's going to be a long haul." After their private meeting, Kim hosted Pompeo for lunch at the Paekhwawon State Guest House. As Pompeo waited for him, he clasped his hands in front of his body and State Department spokesperson Heather Nauert said, "It's like you are standing at the alt[a]r," according to the pool report. Pompeo smiled but said nothing in return. When Kim entered the room, the leaders exchanged pleasantries. "So is everything OK?" Kim asked through an interpreter as they walked toward the banquet hall. "Everything is great," Pompeo said. "Everything is great. I am very much looking forward to our time together too." As the guests took their seats at the table, Kim said, "It's a very nice day that promises a good future for both countries." Pompeo thanked him for hosting the event and conveyed President Trump's regards. Later that afternoon, Pompeo touched down in Seoul to meet with South Korean President Moon Jae-in. Moon thanked Pompeo for coming straight to the capital after his meeting with Kim, calling it a very important day. He said, "I dearly hope that your latest visit, as well as the upcoming U.S.-North Korea summit, which I hope will be happening soon, will make an irreversible and decisive progress in terms of complete denuclearization on the Korean Peninsula as well as the peace process." He asked Pompeo to share what he could with the public. Pompeo thanked him and said, "I don't have much to add. I will certainly tell you in private about our conversation, but we had a good, productive conversation." He continued, "As President Trump has said, there are many steps along the way and we took one of those today; it was another step forward." Pompeo offered no further details, such as whether he had established a time and place for a second summit or what either side was demanding, but Moon's press secretary shared more in a statement reported by South Korean news agency Yonhap: At a closed meeting, Pompeo told Moon that he and Kim agreed to arrange a second U.S.-North Korea summit "at the earliest possible date," as well as discuss the specifics of date and location, Press Secretary Yoon Young-chan said. Pompeo also spoke about additional denuclearization steps and Washington's monitoring of the verification process and "corresponding measures," Yoon said. "The two sides will form working-level negotiation teams to discuss North Korea's denuclearization process and Trump-Kim summit schedule," Yoon said. Spokesperson Heather Nauert said later on Sunday that Pompeo and Kim also agreed to instruct their working-level teams to meet soon, and that Kim invited inspectors to visit the Punggye Ri nuclear test site to confirm that it had been irreversibly dismantled. The U.S., in its mission for a fully verified denuclearization of North Korea, demands that the country turn over a full inventory of its nuclear weapons program. North Korea has rejected those demands and wants sanctions to be lifted before nuclear talks proceed. South Korea has suggested that the U.S. sign a treaty formally ending the Korean War, in exchange for North Korea closing its main nuclear plant, as NPR's Anthony Kuhn reported for our Newscast. Gridlock has been part and parcel of the negotiation process. In August, Trump canceled Pompeo's trip to North Korea because they were "not making sufficient progress" in the denuclearization of the Korean Peninsula, he said. On Sunday, after Pompeo's meeting with Kim, Trump tweeted "Progress made on Singapore Summit Agreements! I look forward to seeing Chairman Kim again, in the near future." Pompeo's trip started with a visit to Tokyo on Friday, where he met with Japanese Prime Minister Shinzo Abe to coordinate positions in the push to get Pyongyang to relinquish its nuclear weapons. On Monday, Pompeo is expected to land in Beijing — the last stop on his whirlwind diplomatic tour.